The Global Volcanism Program has no activity reports for Uliaga. The Global Volcanism Program has no Weekly Reports available for Uliaga. The Global Volcanism Program has no Bulletin Reports available for Uliaga. The small, triangular, 3-km-wide island of Uliaga, located at the NE end of the Islands of the Four Mountains archipelago immediately NW of Kagamil Island, is composed of a small, eroded stratovolcano. Uliaga volcano rises to only 888 m and is the smallest of the Islands of the Four Mountains volcanoes. There are no reports of historical eruptions from Uliaga, but the volcano was considered to have been active during the Holocene (Nye et al., 1998). The Global Volcanism Program is not aware of any Holocene eruptions from Uliaga. If this volcano has had large eruptions (VEI >= 4) prior to 10,000 years ago, information might be found on the Uliaga page in the LaMEVE (Large Magnitude Explosive Volcanic Eruptions) database, a part of the Volcano Global Risk Identification and Analysis Project (VOGRIPA). There is no Deformation History data available for Uliaga. There is no Emissions History data available for Uliaga. 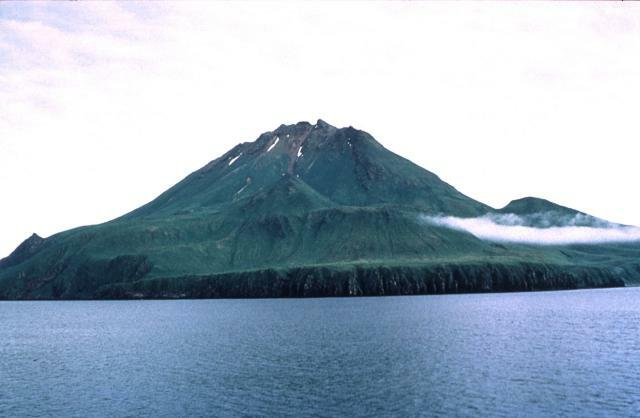 An eroded stratovolcano forms the small, trianglular, 3-km-wide island of Uliaga, located at the NE end of the Islands of Four Mountains archipelago immediately NW of Kagamil Island. Uliaga volcano rises to only 888 m and is the smallest of the "Islands of Four Mountains" volcanoes. Little is known geologically about this volcano, and there are no reports of historical eruptions. Photo by Michelle Harbin (courtesy of U.S. Geological Survey, Alaska Volcano Observatory). There are no samples for Uliaga in the Smithsonian's NMNH Department of Mineral Sciences Rock and Ore collection. Large Eruptions of Uliaga Information about large Quaternary eruptions (VEI >= 4) is cataloged in the Large Magnitude Explosive Volcanic Eruptions (LaMEVE) database of the Volcano Global Risk Identification and Analysis Project (VOGRIPA).